On Good Friday we were finally able to coordinate our schedules so that three families could make a trip to visit my mother. She is now 97, soon to be 98. There were two car loads of us. 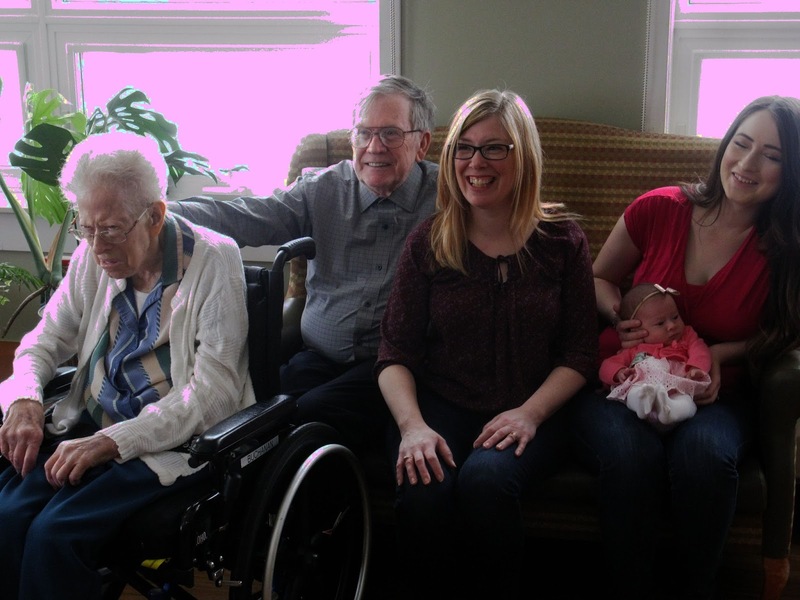 My granddaughter, T, was especially anxious to get a 5-generation photo with her new baby. We found Mom sitting at a table in the dining room and brought her into the TV/social room to visit and take some photos. She was somewhat disoriented but my daughter, L, has a special talent for communication, and we visited with Mom from about 10:15-11:00 am. She kept asking us where her sister Vi was, and whether she would come and visit her today. She deeply misses her deceased sister, who was her best friend and constant companion at family outings and social events for the past 40 years. This past year or two has been very hard on my mother. Besides the aerial views, I enjoyed the haunting melody and words of "The Hills Above Drumquin", which includes references to Cooel (now pronounced "cool") and Kirlish and Langfield. I am seldom described as "sentimental" but it actually brought a tear to my eye. That evening we had a special musical program to celebrate Easter, entitled "He Is Risen". Some of our family members were in the choir. I was surprised at the difficulty of finding a parking spot for the car and seats for the two of us in the chapel. It was a thrilling retelling of the age-old story of Christ's love, his suffering for our sins and our hurts, and his victory over death. Christ lives!